Once operating as the main entrance of the home now resides two symmetrical parlors divided between two pocket doors. The character and details of the house are popularly known as Greek Revival. The Aiken-Rhett House is a beautiful time capsule built in 1820. The tour takes you back into time seeing what it was like living in Charleston, South Carolina during the era. The home was passed down through several individuals who created what we see today. The wealthy merchant, John Robinson, purchased the land and built the original house. Governor William Aiken purchased the house; therefore, passing it down to his son William Aiken Jr. After William Jr.'s death the house went to his daughter Harriet Lowndes Aiken and his son-in-law Major A.B. Rhett. They went on to raise their children in the house and made renovations to the property that are visible today. The house is now owned by the Historical Charleston Foundation and located at 48 Elizabeth Street. They’ve adopted a conservation approach holding true to the style and original state of the house. They seek to preserve and protect the building and artifacts of historical significance. Circular plaster centerpiece located in the two symmetrical drawing rooms. From the center moving outwards with 12 radiating acanthus leaves enclosed within a plain band centered by a beaded trim. The ornate outer trim with rosettes encloses the medallion from which is suspended a glass French chandelier. Main central stair hall leading to all three floors. This room is rectangular with a wooden staircase and two octagonal-and-turned balusters to each tread. The furniture and decor in the house are original to the families who lived there. It is clear that time has left its mark. There is still something so beautiful about the scroll work and "C" - curves that go into this floor mirror spanning the second floor hallway as shown above. View looking up to the third story ceiling, a plaster cornice, and centerpiece consisting of 12 radiating acanthus leaves surrounded by a greek key fret band. Buildings in the south have two and three story porches, known as piazzas, that are strategically designed to take full advantage of the local winds. The porches also come in handy as a covering when the afternoon rain showers begin. The columns of the porch are doric in character with turned baluster railings. The single hung windows transform into doorways that allow you to walk onto the verandahs. These windows are advantageously placed to allow for a cross breeze through the house and are extremely common in the South. All of the colored photographs pictured above were taken by me on our tour of the Aiken Rhett. The information I gathered was from an audio tour and, much to my surprise, the amazing documents compiled after 1933 by the Historic American Buildings Survey. I found the information through the Library of Congress. The black & white photographs appear to be taken between 1977 - 79. I cannot pinpoint the era in which the drawings were created but to my understanding it appears to be after William Aiken junior died and passed the home down to his daughter & son-in-law. The drawings show changes to the structure by transforming the size of the two drawing rooms and moving the main entrance to the side of Elizabeth street. 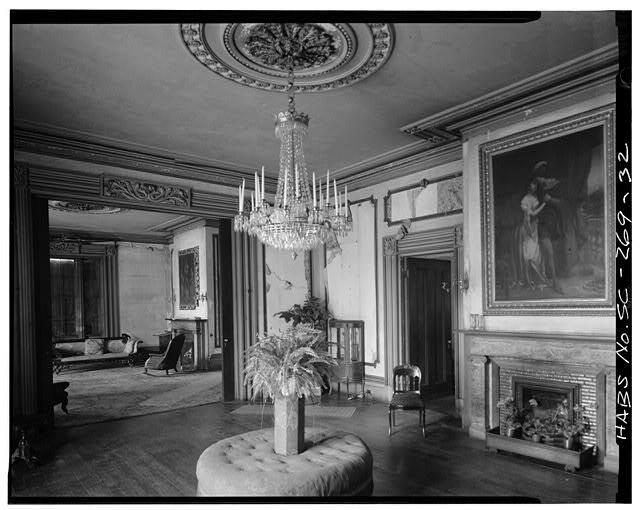 First floor southwest room, also known as the two symmetrical drawing rooms. Check out my other post about The Charleston Foundations additional property, The Nathaniel Russell House. Please let me know what you thought about this post? All feedback is always welcome & helpful.